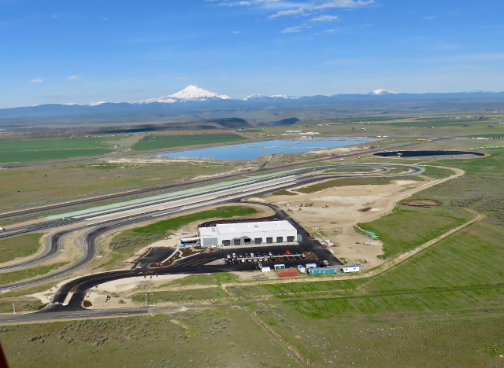 PORTLAND, Ore. – May 18, 2017 – Today Daimler Trucks North America (DTNA) celebrated the completion and official opening of its new High Desert Proving Grounds in Madras, Oregon. The total High Desert Proving Grounds project required an $18.7 million investment by DTNA. Work began in June 2015 to clear the land with construction commencing in May 2016 by general contractor Kirby Nagelhout. The new proving grounds provide two distinct functions: firstly to merge real-world validation of DTNA’s research and development and engineering initiatives and secondly to help bring new technologies to market faster than ever before. The 87 acre High Desert Proving Grounds is critical for assurance of reliability, durability and fuel efficiency for Freightliner, Western Star, Thomas Built Buses and Freightliner Custom Chassis vehicles. 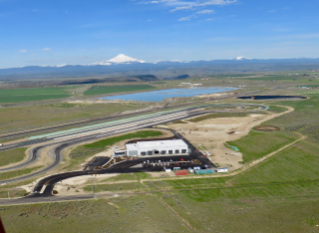 The track will serve as a key component in the company’s ongoing testing in the areas of truck platooning and autonomous vehicles. Attending the facility’s grand opening celebration were Roger Nielsen, president and CEO, Daimler Trucks North America; Wilfried Achenbach, senior vice president of engineering; and Madras Mayor, Royce Embanks. Additional local and state officials as well as trade and local media attended to witness the opening. The High Desert Proving Grounds is located approximately 120 miles southeast of DTNA’s Portland Headquarters, allowing the engineering team easy access to the testing facility. The proximity to the engineering team and variable climate options were vital pieces of the location selection. The route from Portland to Madras also provides vehicles real world validation by including portions on the interstate, rural roads, and mountainous terrain through the Mount Hood pass. Most recently the route has been used to validate potential gains of truck platooning, just one technology that DTNA is exploring for the future benefit of our long-haul fleet customers. The test track is 3.5 miles of highly engineered surfaces that allow engineers to simulate a typical vehicle’s full service life in approximately six months. The 32,000 square foot office building will be home to up to 40 employees, the majority of which will be hired locally, with responsibility for both driving and test engineering. Additionally, there are 14 service bays for technicians to work on and inspect the fleet of durability test vehicles. Daimler Trucks North America was founded by Leland James over 70 years ago as Consolidated Freightways before becoming Freightliner Corporation in Portland in 1947. In 1981, Daimler-Benz AG (now Daimler AG), one of the world’s premier automotive companies and builder of heavy-duty commercial vehicles, purchased Freightliner Trucks from Consolidated Freightways, and in the following decade, vehicle sales more than doubled. With its vast technological resources, Daimler-Benz helped Freightliner Trucks reach the top of the North American heavy-duty truck market by 1992. Today, DTNA is North America’s leading manufacturer of commercial vehicles, selling approximately 140,000 commercial vehicles annually, including significant export sales worldwide.